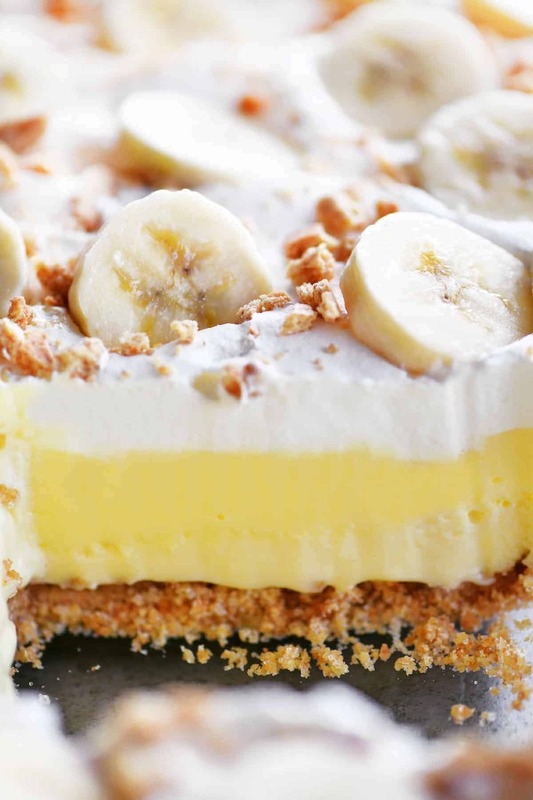 This Banana Cheesecake Dessert has layers of cheesecake, banana cream pudding and cool whip on a graham cracker crust and is topped with banana slices! It all started with one of my husband’s favorite childhood desserts: Blueberry Cheesecake Dessert. Since that cheesecake is so good, I decided to keep on making different flavors. I’ve had many requests from readers for a banana version of the cheesecake dessert. So here it finally is…Banana Cheesecake Dessert! 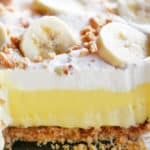 Where is the banana cheesecake dessert recipe? 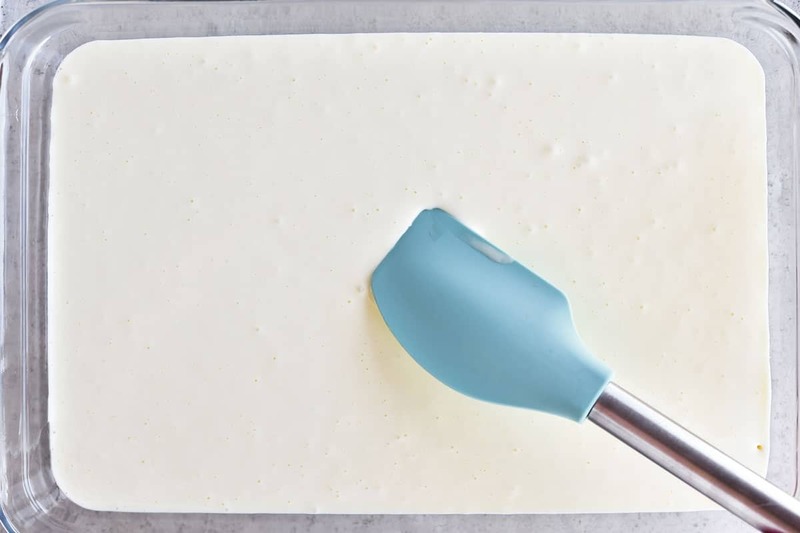 In this post, I will share step-by-step instructions with photos for how to make the cheesecake, as well as answering FAQs about the recipe and sharing a short video showing the recipe in motion. But you can go directly to the recipes by scrolling down to the bottom of the post. 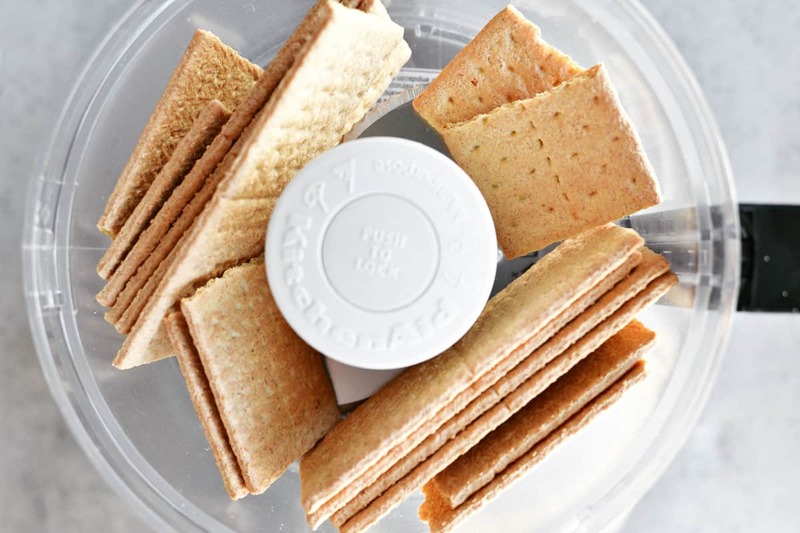 Start by crushing graham crackers to make graham cracker crumbs. You can use a food processor, if you have one, or put the graham crackers in a gallon-sized ziptop bag and use a rolling pin to crush them. Another option is to buy the graham cracker crumbs already crushed! Add granulated sugar and melted butter to the graham cracker crumbs and pulse in the food processor until the crumbs start to clump together. Or stir the sugar and butter into the crumbs with a fork. 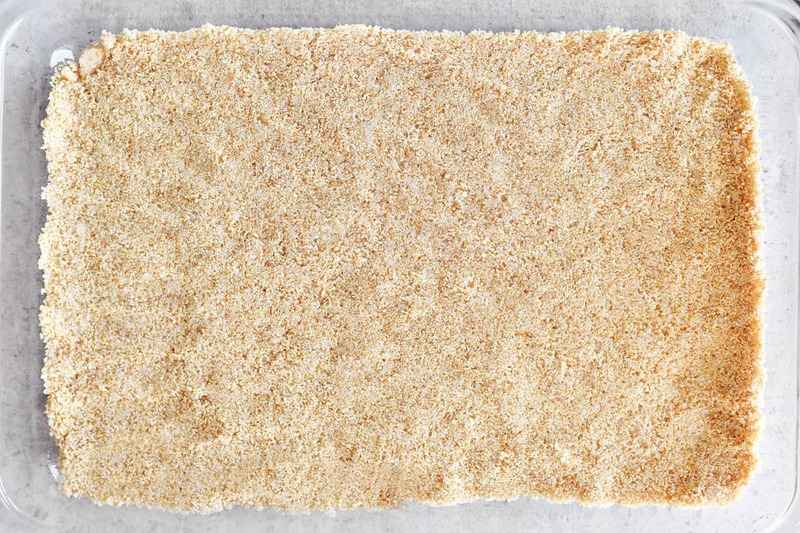 Press the graham cracker crumbs into the bottom of a 9×13 pan and set it aside. 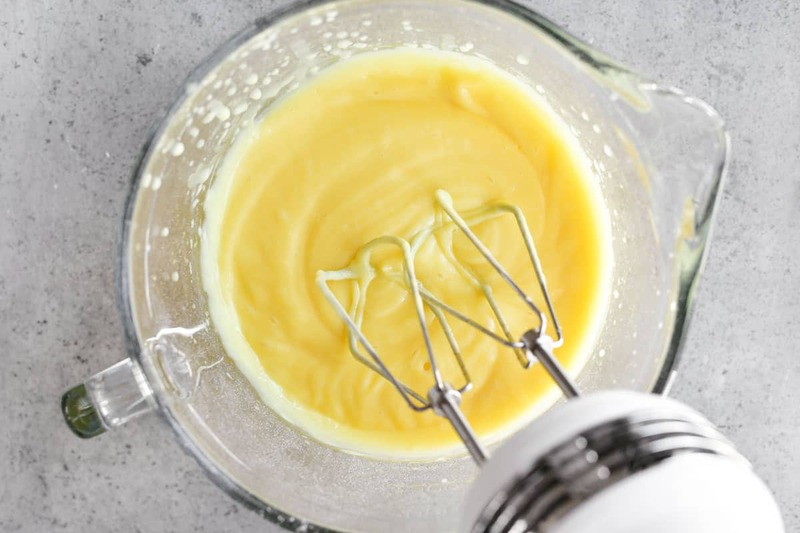 Use a mixer to beat two blocks of softened cream cheese until light and fluffy. Add the granulated sugar, beaten eggs, and vanilla extract. Mix until smooth, scraping down the sides of the bowl when needed. Spread the cheesecake batter out over the graham cracker crust in the 9×13 pan. Bake at 375˚F for 20-25 minutes and then cool completely. Beat two packages of banana cream pudding mix and milk. Stir in one cup of cool whip. Spread the banana cream pudding over the cooled cheesecake layer. 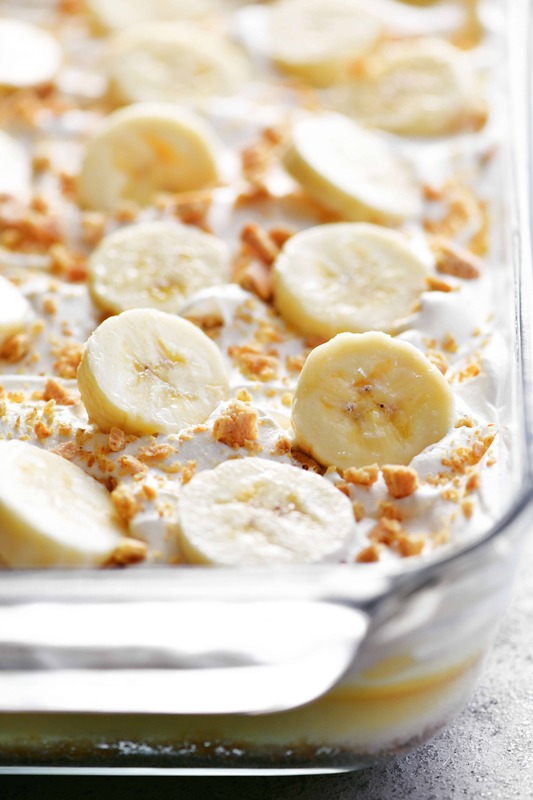 Top the banana cream pudding with cool whip and spread it out in an even layer. Sprinkle graham cracker crumbs over the top of the cheesecake. Slice two bananas and top the cheesecake with the banana slices. 1. What other kinds of pudding would work in this recipe? Pretty much any kind of pudding you can buy! See my recipe for Chocolate Cheesecake Dessert using chocolate pudding here. I also want to try key lime pudding, lemon pudding, and coconut cream pudding. 2. Would other kinds of graham crackers be good in the crust? Yes! That another way to change the recipe is to change the kind of crust. Try cinnamon, vanilla, or chocolate graham crackers. 3. 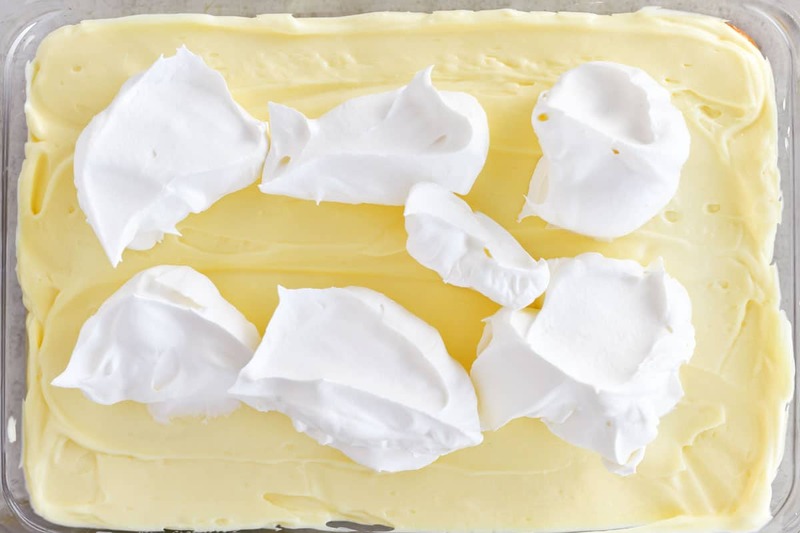 Can I use whipped cream instead of Cool Whip? Yes, if time allows, make four cups of whipped cream to use in place of the Cool Whip. 4. What can I do to lighten this recipe? 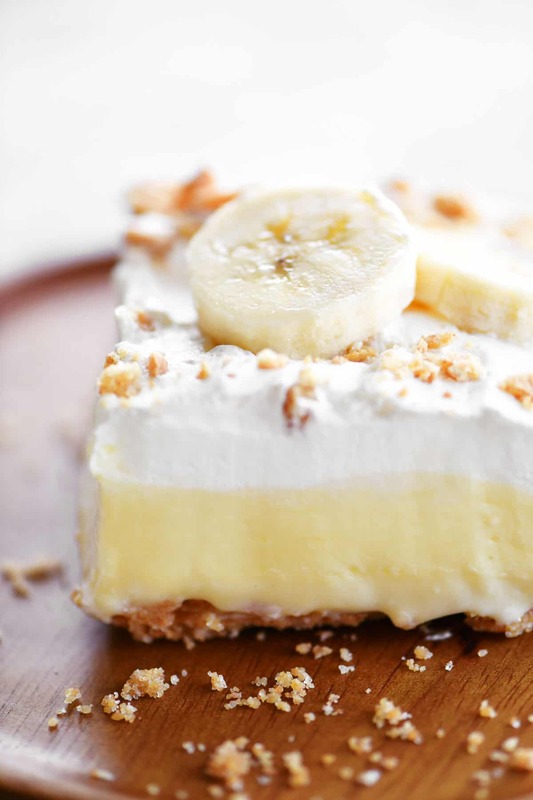 For a lighter version, try using 1/3 less fat cream cheese, low-fat graham crackers, replace a portion of the sugar with a sugar alternative, use sugar-free banana pudding mix, and use light Cool Whip. But keep in mind that any alterations may change how the cheesecake turns out. 5. Can this cheesecake be made in a different size pan? Yes, but depending on the thickness of the cheesecake batter the cooking time may be altered. 6. Can this cheesecake be prepared ahead of time? Yes! We often make it ahead of time to bring to family gatherings. If you plan to serve it the following day, wait to add the banana slices until right before serving so that they don’t get brown. This Strawberry Cheesecake Dessert recipe is creamy and smooth with strawberry pie filling and whipped cream. It’s been part of our family for generations! Pumpkin Cheesecake Dessert has two layers of smooth, creamy cheesecake with a gingersnap crust. Made in a 9×13 inch pan this cheesecake is made for sharing! Caramel Apple Cheesecake Dessert is perfect for fall with a cheesecake layer topped with apple pie filling, caramel sauce, and whipped cream. Crush the graham crackers. Stir in the granulated sugar and the melted butter. Press into 9x13 inch pan. Set aside. Beat the cream cheese until smooth. 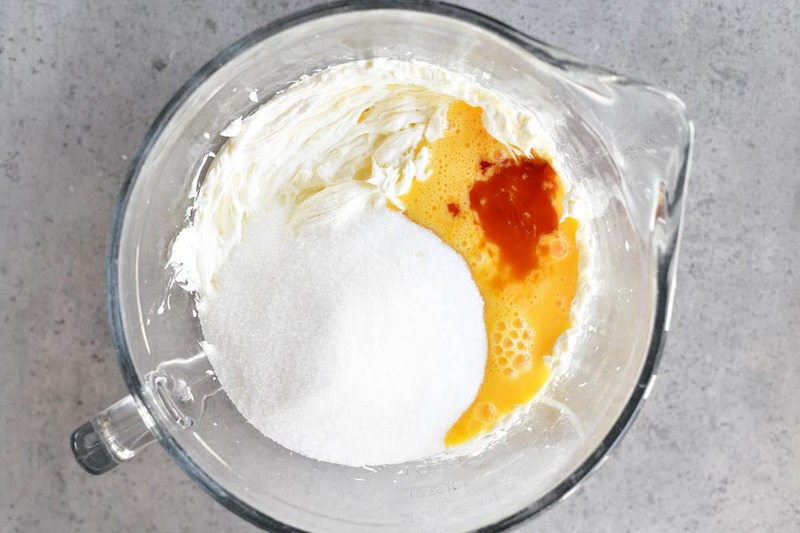 Add the beaten eggs, sugar, and vanilla. Mix until smooth, scraping the sides of the bowl as needed. Pour the cream cheese mixture over crust and bake at 375˚F for 20-25 minutes, or until done (top is dry to touch). Beat two package of instant banana cream pudding with the milk. Stir in the cool whip. Spread over the cooled cheesecake layer. 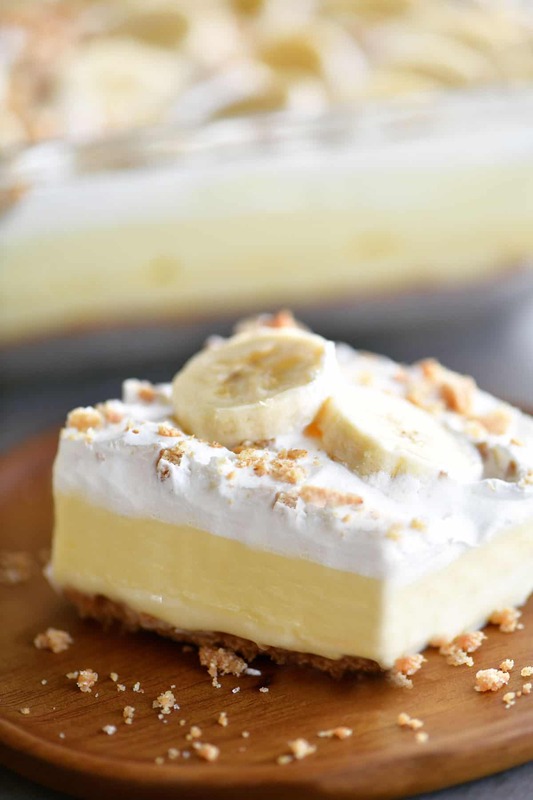 Top the cheesecake with cool whip, roughly chopped graham crackers and banana slices.